A Patent is an exclusive set of rights granted by the Authority to the Applicant of an invention for a period of 20 years under the Patent Act in India. Patent is a legal document, which gives an inventor the exclusive right to make, use, and sell an invention for a specified number of years. To qualify for a patent, the invention must meet three basic tests. First, it must be novel, meaning that the invention did not previously exist. Second, the invention must be non-obvious, which means that the invention must be a significant improvement to existing technology. Simple changes to previously known devices do not comprise a patentable invention. Finally, the proposed invention must be useful. Legal experts commonly interpret this to mean that no patent will be granted for inventions that can only be used for an illegal or immoral purpose. Patent Is an intellectual property which protects your invention and prevents other to use it without your prior permission. Ideas and Concept also eligible. Even first step of patent registration, i.e. patent filing itself (Provisional Application) security and surety that no other person could claim the same invention for 12 months. After which non-provisional application has to be filed with complete claims and description. Meanwhile, If someone tries to claim the invention as theirs, then their request will get rejected for filing period. You got exclusive right for 20 years. Therefore the patent holder retains an absolute monopoly on product or process for the period of patent. You can sell or transfer the patent right to other against fair consideration. A patent is an Intangible assets in Books of accounts like other Fixed Assets. Its value in the Books recorded at Cost Model or Revaluation Model. For More details of Valuation See Accounting Standard 26 issued by ICAI. Provisional/ Complete Application for all kind of applicant. Fee varies. For all kind of applicant. Fee varies. The above mentioned fee is covered Application Filing, Request for Examination and Filing of Response against Objection. Invention Description Specification upto 30 pages is Free and for Extra Pages, Govt. Fee payable on actual basis. Any Other Services Like Legal Proceedings against Opposition filed, Litigations and any Other Services is separate. Our Patent Professional give on call consultation to client first to make him clear about the process of registration with Authority, understand his/her project and documents requirement and pricing. Patent Professional perform an extensive search for prior art in all possible databases for patent, articles, thesis etc. and based on that a Search report prepared for you. Patent Professional prepare your application and co-ordinate with you for Title of invention, details specification of invention and relevant facts. Once your application drafting is completed and checked properly, we file your application along with payment of Govt. fees. In case of Filing of Provisional Application ( For Idea, Concept and R&D stage), again within 12 months Complete application also file with details specifications of the invention. This Compliance we do, If there is any objection raised by the Examiner/Controller. We file the response within the lime limit. On Successful passing of Examination stage, You Patent is Granted by the authority. Our Professional Serve best to get it done smoothly by complying all technical and legal formalities. Disclosure of Invention to Professional/Agent This is first step to start processing your Patent registration. Need to hire a Professional ( or Patent Agent) by signing NDC (Non Disclosure Agreement ). Here you need to disclose your Details of your Invention, Description diagrams and experimental result, without hiding anything. Novelty Search (or Patentability Search) A Novelty Search or Patentability Search is generally conducted in the early stages of Research & Development. This search is conducted when an inventor is interested in applying for a patent, and wants to determine whether a similar or identical invention already exists. In this phase, patent professional performed an extensive search for prior art in all possible databases for patent, articles, thesis etc. and based on that a Search report prepared which helps to determine that an application for Patent could be filed with authority. The main purpose of Novelty Search is to get Professional Opinion on Novelty/Uniqueness, Inventive Step and its Applicability in the industry before you go for Filing. That saves your cost. IT IS OPTIONAL FOR APPLICANT. Decision to file Patent application Based on Novelty Search Report of Professional OR At your own option you decide to go for Patent Application Filing with Authority and Hire a Professional ( or agent) to avoid any mistakes. # IF at Early Stage of R & D, Ideas and Concept stage – Opt ‘Provisional Patent Application’. Drafting Application Next job is Drafting of patent application. It is specialised job and requires both technical (field of invention) and legal (Indian patent act) understanding. A patent is a techno-legal document Writing patent application as a technical document without considering legal aspect may be a mistake which can make your application not worth a lot. And all the efforts you took for research and development can go waste. Hence, right Patent professional (or agent) with appropriate experience can remarkably add value to patent application. Filing of Application Once your application drafting is completed and checked properly, next step is to file the patent application in prescribed manner. That is in the appropriate forms along with Govt. fees. Govt. Fees varies based of type of applicant. If you do not opt for early publication (with extra Govt fee varies 2500 to 12500, publish in one month) the patent application will be published on expiry of 18 months. Request for Examination The request for examination is to be made within 48 months from the date of filing the patent application, in the prescribed form along with fees. This request is basically made to Indian patent office to examine your patent application. Respond to objections If there is any objection raised by the Examiner based on his examination, you have the the option to file Response against the Examination Report. Grant of Patent When all the stages are successfully passed and meet compliance and eligibility requirements, Patent is granted and goes for Publication. What types of inventions are not patentable in India? The mere discovery of scientific principle or the formulation of an abstract theory or discovery of any living thing or non-living substance occurring in nature; The mere discovery of a new form of a known substance which does not result in enhancement of the known efficacy of that substance or the mere discovery of any new property or new use for a known substance or of the mere use of a known process, machine or apparatus unless such known process results in a new product or employs at least one new reactant; Explanation: For the purposes of this clause, salts, esters, ethers, polymorphs, metabolites, pure form, particle size, isomers, mixtures of isomers, complexes, combinations and other derivatives of known substance shall be considered to be the same substance, unless they differ significantly in properties with regards to efficacy. Explanation: For the purposes of this clause, salts, esters, ethers, polymorphs, metabolites, pure form, particle size, isomers, mixtures of isomers, complexes, combinations and other derivatives of known substance shall be considered to be the same substance, unless they differ significantly in properties with regards to efficacy. Drafting a patent application is a specialised job and requires both technical (field of invention) and legal (Indian patent act) understanding. As you know, patent is a techno-legal document. Many inventors trying to write patent application on their own writes it from completely technical perspective. Writing patent application as a technical document without considering legal aspect may be a mistake which can make your application not worth a lot. And all the efforts you took for research and development can go waste. Hence, right patent professional (or patent agent) with appropriate experience can remarkably add value to patent application. FinTaxx Patent Professional is the right choice to get your Patent registration success. Is FinTaxx Patent Professional works in all State for Patent Registration? How much time taken to get the Patent Application filed? No. Patent protection is a territorial right and therefore it is effective only within the territory of India. There is no concept of global patent. country where the applicant requires protection of his invention. An invention relating either to a product or process that is new, involving inventive step and capable of industrial application can be patented. However, it must not fall into the categories of inventions that are non- patentable under sections 3 and 4 of the Act. What is the criteria of patentability? iv) It should not attract the provisions of section 3 and 4 of the Patents Act 1970. (ii) there may be either an inadvertent publication of the invention by the inventor himself/herself or by others independently of him/her. website. After its publication, public can inspect the documents and also may take the photocopy thereof on payment of the fee as prescribed. It is not necessary to visit the patent office to file the application as online filing facility is provided. Only in case the application is required to be filed offline, the same can be filed physically at the counter of the Office. Moreover, all the communications with the office are made through emails. However, hearing proceedings relating to patent application can be attended with prior appointment on any working day during prosecution stage. Where can one find the information relating to published/ granted patent application? The information relating to the patent application is published in the Patent office Journal issued on every Friday. This is also available in electronic form on the website of the Patent Office, www.ipindia.nic.in. A patent application can be filed with Indian Patent Office either with provisional specification or with complete specification along with prescribed Govt fee. In case the application is filed with provisional specification, then one has to file complete specification within 12 months from the date of filing of the provisional application. There is no further extension of time to file complete specification after expiry of said period. How can one register for online filing of patent application? To register for filing of patent application, the user is required to obtain the Class III digital signature. After obtaining the digital signature, the user can register himself on the CGPDTM website by creating his user ID and password. 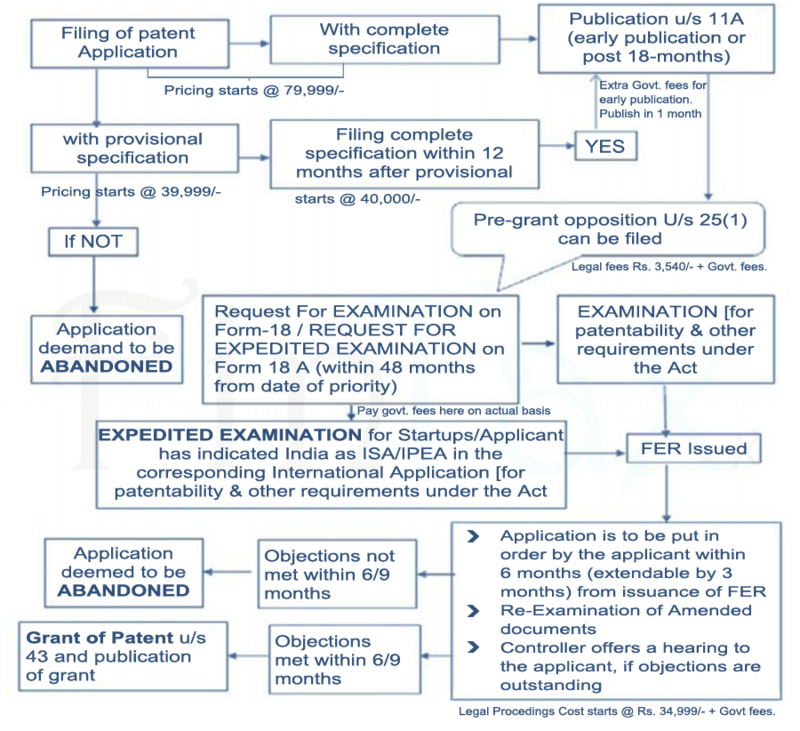 Is there any jurisdiction for filing patent application in India? Yes, India has four patent offices located at Kolkata, New Delhi, Mumbai and Chennai. Each office has a separate territorial jurisdiction. The appropriate office for all proceedings including filing of the application depends normally where the applicant/first mentioned applicant resides/has domicile/has place of business/has origin of invention. In case of foreign applicants, it depends on the address for service in India given by such applicant. When can an applicant withdraw patent application in India? will not be published and be treated as ―withdrawn‖. claim a refund of up to 90% of examination fees. 3) An applicant can withdraw the application any time after its filing but before the grant of patent by making a request. There is no fee for withdrawing the application. And also there is no refund of examination fee. CONTACT FINTAXX PATENT PROFESSIONAL FOR THIS. Generally, when an invention is not complete an application can be filed with provisional. specification. However, it is not necessary to file an application with provisional specification and one can file application directly with complete specification. Every application for patent is published after expiry of 18 months from the date of its filing or priority date whichever is earlier. However, following applications are not published. Is there any provision in the Patents Act for early publication? Atomic energy or Defence purpose. Is patent application once filed examined automatically? A patent application is not examined automatically after its filing. The examination is done only after receipt of the request of examination in Form 18 either from the applicant or from third party or Form 18A for expedited examination (under conditions as prescribed in the Rules). When can the request for examination be filed? The request for examination can be filed within a period of 48 months from the date of priority or date of filing of the application whichever is earlier. For more details kindly refer to rule 24B of the Patents Rules 2003 as amended. After examination, the Patent office issues an examination report to the applicant which is generally known as First Examination Report (FER). Thereafter the applicant is required to comply with the requirements within a period of 6 months from the date of FER which can be extended by 3 months (There is no provision for extension of time beyond the said period and the application is deemed to have been abandoned).In case, the application is found to be in order for grant, the patent is granted, provided there no pre-grant opposition is filed or pending. A letter patent is issued to the applicant. However, in case a pre-grant opposition is pending, the further action is taken after disposition of the pre-grant opposition. Does an applicant get an opportunity of being heard before his application is refused? If the applicant does not file a reply within 6 months or does not take an extension of 3 months, the application is deemed to have been abandoned. Is there provision for extension beyond time limit of 9 months? If applicant has not complied with the requirements within the prescribed time, the Controller shall provide an opportunity of being heard to the applicant before refusing his application if a request for such hearing has been made by the applicant at least 10 days in advance before expiry of the statutory period. A representation for pre-grant opposition under section 25(1) of Patents Act, 1970 can be filed, on Form 7A within six months from the date of publication of the application u/s 11A or before the grant of patent. No, there is no fee for filing representation for pre-grant opposition. This can be filed by any person. What are the e-filing facilities available for Patent on Website of IP India (www.ipindia.nic.in)? • 10% fee reduction on online filing compared to offline filing to promote online filing. The Patent Office has no role beyond grant of patent. Since patents are private rights the patent owner is responsible for commercialising the patent either himself or through licensee. However, the information relating to grant of patent is published in the Patent Office journal and also published on the Patent Office website which is accessible to the public worldwide. This certainly may help the applicant to attract potential user or licensee. The patent office also compiles and updates a list of patents which are lapsed/ceased in India. Is Indian patent database searchable? How can one find out whether an invention is already patented? The person concerned can perform a search free of cost on Indian Patent database consisting of published patent applications and granted patents. The said database is available on Patent Office website http://ipindiaservices.gov.in/publicsearch. Further, the website (www.ipindia.nic.in) contains innovative tools under DYNAMIC UTILITIES which gives information about the patent applications at various stages of processing. Yes, the Patent Rules provides for different fee for individuals/Startups, SME‘s and legal entity. Details can be seen in the First Schedule of the Patents Rules, 2003 as amended from time to time. When can a patent be restored after its cessation? Is it mandatory to obtain prior permission from the Patent Office to file application for patent outside India or abroad? (b) If the applicant is Indian resident and filed patent application has been in India before filing the application outside India and six weeks period is over from that date. Residents of India require prior permission to apply for patents outside India under section 39 of the Patents Act, 1970 under following circumstances. (b) Applicant does not wish to file patent application in India prior to filing outside India. However if the invention is relevant for Defence or Atomic Energy purpose, no permission shall be granted without the consent of Central Government. Is there any additional requirement for filing of patent applications in respect of microbiological inventions? In addition to the various forms required to be filed at the time of filing the patent application, the applicant is also required to deposit the new strain of a microorganism if used in the invention disclosed in the patent specification, in a recognized depository which assigns a registration number to the deposited microorganism, before filing for the patent application. This number needs to be quoted in the patent application. Are there any specific instructions to inventors in respect of filing for patent applications where their invention lies in biological material? The Patents Act, 1970 as well as the Biological Diversity Act, 2002 stipulates that the source and geographical origin of the biological material should be clearly disclosed in the patent specification. Further, according to the provision of Section 6 of the Biological Diversity Act, if the biological material used in the invention is from India, permission from the National Biological Authority has to be obtained by the applicant, and the same should be submitted to the Patent Office before the grant of patent. Is it essential to deposit biological material in the international depository authority? Is there any International Depository Authority in India? Are there any restrictions with respect to the hearing adjournments? The Amended rules, 2016 provides for restriction on the number of hearing adjournments to two and each adjournment shall not be more than thirty days each. These adjournments have to be requested at least three days before the date of hearing. What are the rights of a patentee once the patent is granted? A patentee enjoys the exclusive right to make and use the patented invention. The patentee also has the right to assign the patent, grant licences, or otherwise deal with the patent, for any consideration. These rights, created by statute, are circumscribed by various conditions and limitations as prescribed under the Patents Act.1970. Is it necessary to show working of a patent after grant? Under the provisions of section 146, every patentee or a licensee, is required to furnish the information relating to working of patent, statement as to the extent to which the patented invention has been worked. This must be submitted on Form 27 by 31 March each year for the previous year ending 31 December. This is an international treaty governing the deposition of microorganisms, cell lines etc in international approved authority approved by WIPO for the purpose of patent applications in any country that is a party to it. Because of the difficulties and, on occasion, of virtual impossibility of reproducing a microorganism from a description of it in a patent specification, it is essential to deposit a strain in a culture collection centre for testing and examination by others. There are many international depositories in many countries, which are recognised under the Budapest Treaty. IMTECH, Chandigarh is a recognised depository in India. What are the modes of filing a patent application in foreign countries? Since there is no worldwide patent, the applicant has to file his patent application in respective countries separately to obtain protection on his invention. The following are the routes available to the applicant to file his International application in foreign country. Paris Convention: The Paris Convention for the Protection of Industrial Property, established in 1883, provides for 12 months time to file the patent application in the member countries from the date of filing of the earliest application. Patent Cooperation Treaty System: PCT is a system which allows an applicant to file in PCT contracting states within 30-31 months from priority date instead of 12 months. Not only does the PCT enable extended time period, it also simplifies filing procedure through a single application. The PCT system also provides for publication of application, International Search and International Preliminary Examination before entering the national phase . control of the national or regional patent offices after the corresponding ―national phase‖ application has been filed and the national phase application is assessed as per patent law of that jurisdiction. As per Indian Patent Act 1970 as amended and the Patents Rules 2003 as amended by (amendment) rules 2016, any PCT international application may be filed designating India and it shall deemed to be an application if the corresponding national phase application has also been filed. What is the procedure of PCT? A) Filing: File an international application with a RO/IN national patent Office or directly with International Bureau (IB) of WIPO, complying with the PCT formality requirements and fees. In India PCT application are filed at appropriate patent offices decided on the basis of territorial limits (Rule 4, Indian Patent Act 1970 as amended and patent Rules 2003 as amended). B) International Search: An ―International Searching Authority‖ (ISA) identifies the published patent documents and technical literature (―prior art‖) which may have an influence on whether your invention is patentable, and establishes a written opinion on your invention‘s potential patentability. Indian Patent office, Delhi Branch performs the function of ISA on receipt of prescribed fee specified in Fifth Schedule of patent act 1970 as amended and patent rules 2003 as amended. C) International Publication: After expiration of 18 months from the earliest filing date (Priority Date), the content of your international application is disclosed to the world. D) International Preliminary Examination (optional): one of the ISAs on request carries out an additional patentability analysis, usually on an amended version of your application. Indian Patent office, Delhi Branch performs the function of International Preliminary Examination (IPEA) on receipt of prescribed fee specified in Fifth Schedule of patent act 1970 as amended and patent rules 2003 as amended. E) National Phase: After the end of the international PCT procedure, usually at 30 months from the earliest filing date of your initial application, from which you claim priority, you start to pursue the grant of your patents directly before the national (or regional) patent Offices of the countries in which you want to obtain them. F) TIme Limit: In India, 31 months is maximum time limit to enter national phase. To enter national phase an application corresponding to an international application is made in Form 1.
Who has the right to file an international patent application under the PCT? PCT international patent application may be filed by a national or resident of a PCT Contracting State. If there are several applicants named in the international application, only one of them needs to comply with this requirement. entered data and drawing your attention to incorrectly or inconsistently completed parts. Applicants are also entitled to certain PCT fee reductions when filing electronically (https://pct.wipo.int/). WIPO‘s PCT-SAFE software offers PCT user to prepare international application in electronic form (http://www.wipo.int/pct-safe/en/). In which language can a PCT application be filed? PCT international application in India shall be filed with the appropriate office in triplicate either in English or Hindi. However, the request can be filed only in English. What are the costs associated with the filing and processing of an international application under the PCT? What are the costs for entering the national phase? Refer, Fifth Schedule of patent act 1970 as amended and patent rules 2003 as amended for fee structure for an international application designating India. Are there any fee reductions available under the PCT? PCT fee reductions are available to applicants who file electronically, based on the type of filing and the format of the application submitted. In addition, to encourage the use of the PCT System by applicants from developing countries fee reductions of 90% for certain fees, including the international filing fee, are available to natural persons. Some ISAs also provide for a reduction of the international search fee if the applicant or applicants are nationals or residents from certain countries (see Annex D of the PCT Applicant’s GuideWIPO). How long does the PCT process take? 1) In most cases, up to an additional 18 months from the time you file your international patent application (or usually 30 months from the filing date of the initial patent application of which you claim priority) before starting of national phase procedures with individual patent Offices and to fulfill the national requirements. 2) This additional time can be useful for evaluating the chances of obtaining patents and exploiting invention commercially in the countries in which you plan to pursue patent protection, and for assessing both the technical value of your invention and the continued need for protection in those countries. 4) Since, in the national phase, each patent Office is responsible for examining your application in accordance with national or regional patent laws, regulations and practices, the time required for the examination and grant of a patent varies across patent Offices. Will an international search be carried out for all international applications? i) As a rule, an international search is carried out for all international applications. There are instances, however, where the ISA will not be able to carry out a search. For example, where the international application relates to subject matter which the ISA is not required to search or if the description, claims or drawings are not sufficiently clear for it to carry out a meaningful search. In such cases, the ISA will issue a declaration that no international search report will be issued. ii) There are also circumstances where the ISA will issue a partial search report. This can occur when, in the view of the ISA, the international application contains multiple inventions but the applicant has not paid additional search fees to cover the work required to search those additional invention(s). What are the advantages of the Patent Cooperation Treaty? (j) if your invention appears to be not patentable at the end of the international phase, you may abandon the PCT application and save the costs you would otherwise have incurred by directly seeking protection in foreign countries, appointing local patent agents in each foreign country, preparing the necessary translations and paying the national fees. ePCT is a WIPO online service that provides secure electronic access to the files of international applications filed under the PCT as maintained by the International Bureau. The applicants can file international applications using ePCT-Filing, with RO/IN as well as RO/IB. What are the benefits of filing through ePCT? • Applicants can avail a fee reduction as fixed by PCT division of WIPO from time to time. • Less cumbersome, for both RO as well as for the applicant.